Our accessories for use with air powered liquid dispensing systems. These high quality 5-micron air filters are for use with any compressed air supply. Filters and regulators provide a guarantee to eliminate most moisture and small particles. All pneumatic dispensers require clean and dry air and these filters provide it. Easy installation for these products. 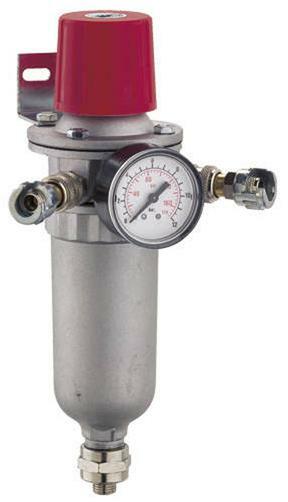 High quality 5 micron air filter regulator to eliminate moisture in the air supply to dispensers, valves, pressure pots and cartridges. 1/4" BSP air inlet to 1/4" BSP swivel tap threads output. Flow rate up to 42 scfm. Liquids coalesce from the filter cartridge as rapidly as they enter the filter. Filter removes moisture for extended periods without loss of efficiency or flow capacity. Aluminium body filter with wall mount bracket. Includes a 0-100 psi gauge. A 5 micron air filter to eliminate 99.99% of moisture in the air supply to dispensers, valves, pressure pots and cartridges. 1/4" NPT threads to input and output. Flow rate up to 6 scfm. Liquids coalesce from the filter cartridge as rapidly as they enter the filter. 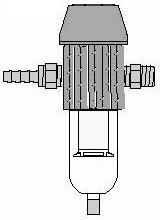 Filter removes liquids for extended periods without loss of efficiency or flow capacity. Easily replace filter tubes without tools. Recommended for use with all air powered dispensers to prevent damage from particles and for moisture sensitive adhesives. Copyright � 2015 Adhesive Dispensing Ltd. All rights reserved.